Look, Just Cause has never been about telling an engaging story. The plots of previous games have loosely tied together various reasons for blowing sh*t up, and we don't expect anything different from Just Cause 4. Heck, going by this "story" trailer, the game itself doesn't even expect anything different. As the headline says, there are more explosions in this trailer than there are plot details. When Rico wants to set the world alight, that's just what he does. Here's to completely forgettable characters, totally predictable side missions, and suitably daft dialogue. 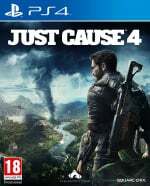 Are you looking forward to Just Cause 4? Pretend that you don't keep forgetting it exists in the comments section below. At the time Just Cause 2 was fantastic but the mess that was JC3, and the fact that they never did anything to fix it, really destroyed my faith in the whole IP. There's too much other good stuff now. i liked the others but did they actually ever have a story. I'm okay being the only person around here who's excited for this, and clearing his schedule for launch day. Looks like just enough story to hold everything together. Any more would get in the way of the point. I hope they have a better optimized engine this time. The framerate on the 3:rd game, was horrible. Even the Pro and X couldn’t fix that. It was troublesome even on my gaming PC. Ah, Just ‘Cuz, my old friend. Never change. @RogerRoger Your not alone, I’m also looking forward to this, going to pre-order the Gold Edition. I can see myself having a load of fun attaching those balloons to all sorts of things. I’ve been playing Just Cause since the first game and not once have I been bothered about the story and the usually bad voice acting, it’s all about the gameplay and blowing s*** up! @MaccaMUFC Same here; got my pre-order secured and can't wait to cause some chaos. Looking forward to swapping opinions with you come December! I dunno, those character models look kinda rough to me. Maybe that's how they'll get the game to run more smoothly on current generation consoles.